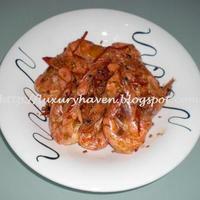 Home » Recipes » Garlic Prawns in Just 3 Steps! I learnt this dish from my late uncle who was a fabulous cook. I used to watch him in the kitchen & he was one of those who had inspired me to cook well. This is a relatively simple dish, great for those busy professionals or those who hardly step into the kitchen. It's as easy as ABC. Best part, it's healthy cause you won't need any cooking oil. Devein prawns by making a slit at the back & removing the veins. Rinse thoroughly. (Optional) Cut away the 2 ends of the chilli & make a slit to remove seeds. Shred the chilli. Heat & place prawns on wok. When the shellfish turn slightly pink, flip them over. Add remaining ingredients when prawns are half-cooked. Stir-fry till prawns are pink & you're ready to eat! Garlic Prawns in Just 3 Steps! My favorite kind of recipe - a few high quality ingredients that quickly cook for an instant dinner! Wow! This looks to be so quick and easy! Can't wait to try. Hah! Tomorrow, as I have prawns in the freezer! Thks, Alison! I've another quick & easy one - Delicious Ham & Mushroom Steamed Fish. Appreciate if you could vote for me & you can also stand a chance to win Samsung Microwave Oven!! http://wildfireapp.com/website/6/contests/55456/voteable_entries/11001917?ogn=website&order=recency. I thank you in advance! Creepy Halloween Pumpkin Treats In Just 3 Steps!